The Vancouver Condo Buzz » From Mid $200’s! Boutique FRAMEWORK Vancouver Condos in Chinatown/Gastown by Porte > Great Studio to 2 Bed+Flex Floor Plans Available! From Mid $200’s! Boutique FRAMEWORK Vancouver Condos in Chinatown/Gastown by Porte > Great Studio to 2 Bed+Flex Floor Plans Available! The Chinatown FRAMEWORK Vancouver condos feature spacious city apartment flats that range from studio layouts to two bedroom condos. The architecture is designed by award winning firm Bingham + Hill Architects and the developer is Porte Development (one of our favourite local builders!). Situated at 231 Pender Street Vancouver in the most historic neighbourhoods of the city, the new Chinatown FRAMEWORK apartments will feature an iconic mid-rise building of 8 storeys with ultra-modern design and an emphasis on true functionality and beautiful interior finishes and features. The new FRAMEWORK Vancouver Chinatown apartments are within walking distance to the Seawall, Telus Sphere (Science World), the hip Gastown district and diverse variety of eateries/restaurants and boutique/big box shops around the area. Also, residents will be minutes away from the core of downtown Vancouver. The contemporary design blends seamlessly into the history and culture of Chinatown with re-integration of heritage doors and brick accents that contribute to the existing streetscape. As well, there is a locally designed mural artwork wall on the west exterior. Again, the new Framework Vancouver downtown condos are brought to you by Porte developments and built by Marcon Construction. All homes come with the standard Traveler’s 2-5-10 new home warranty for your peace of mind! Looking for a truly modern condominium home in a historic and up-and-coming neighbourhood primed for growth and excitement? Check out the new Framework Vancouver condo project by Porte Developments where you will find an exclusive offering of boutique residences ranging between studios to two bedroom floor plans. Here, home buyers will have a choice between 2 designer colour palettes chosen by award winning BYU Interior Design group. The interiors wil have long wearing and durable flooring throughout with choice of laminate or Porte’s custom concrete finished floors. As well, there are double glazed vinyl windows, ample storage and closet space with built in closet organizers and full size washer and dryer in every suite. In addition, the presale Vancouver Framework apartments in Chinatown will feature designer lighting throughout, four in baseboards, outdoor living in every floor plan and USB hook-ups in kitchen (very convenient!). The building itself will have secured underground parking with key fob entry access, a video enterphone in the lobby vestibule outside and smoke alarms/fire sprinklers as per code. There are bike lockers on every floor for convenience and added security (awesome and very unique) in addition to the standard home warranty protection plan by Travelers. In addition to the high-end standards in the living spaces, the Framework Vancouver condos will also feature kitchens that will bring out your inner chef according to their marketing! From the stainless steel appliance package (including a full sized counter depth fridge with bottom freezer by Fisher Paykel, 18” dishwasher by Blomberg, KitchenAid gas range which is full sized and ove the range microwave with hood fan) to the stainless steel under mount sink with pull down Grohe spray faucet, the kitchens at the Porte Framework Vancouver condos are fitted out with the best features you can hope for in a new building. As well, there is generous pantry closets for extra storage in most homes, ultra-modern high gloss white and vertical wood grain soft close cabinets and polished quartz stone counters in the kitchens along with under cabinet pot lights, ceramic tiled backsplash and signature wine rack. One of the most modern and coolest features in the kitchen is a USB hookup to charge your iPad, computer or mobile device while you look for recipes, entertain or need to charge up. 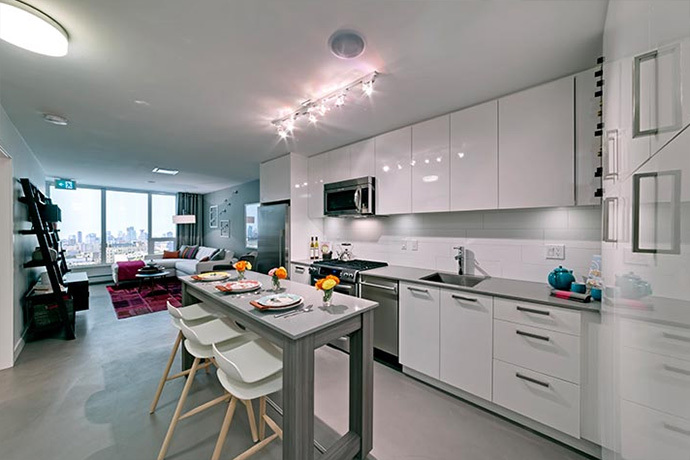 Some of the optional upgrades for your kitchen at the presale Vancouver Framework Chinatown condos includes a custom designed moveable kitchen island with matching quartz stone counter top which is great for extra prep space, casual dining or formal dining table while entertaining. The spa inspired bathroom finishes at the new Framework by Porte Vancouver Chinatown condos includes custom designed vanity with under mount sink, polished chrome Grohe hardware, dual flush toilets and recessed lighting. 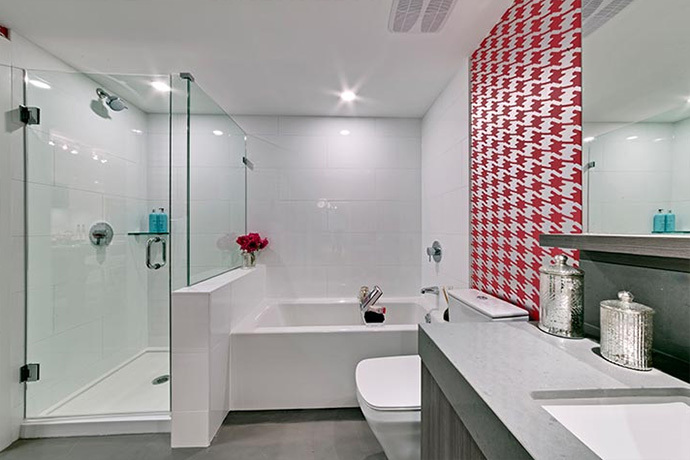 In addition, homebuyers can expect separate tub from shower with frameless shower doors in select homes, oversized white ceramic tiled surrounds, convenient shelf under vanity mirror and either porcelain or concrete floors. 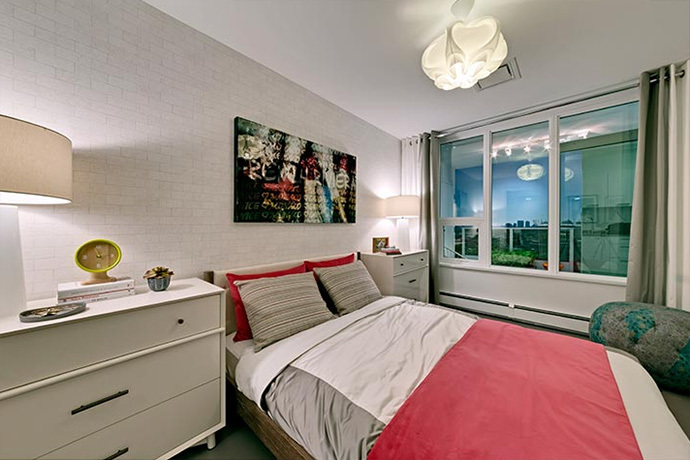 The modern Chinatown Vancouver homes at Framework by Porte will start from the mid $200’s, giving you a very affordable downtown home with great value both short and long term. 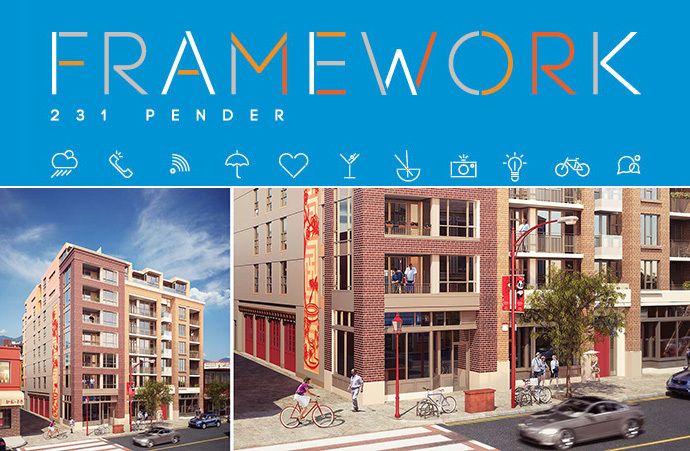 The historic Chinatown Framework condos by Porte will be situated at 231 Pender Street Vancouver, but the presentation gallery and sales centre is opening at 626 Main Street Vancouver (nearby but not on-site as construction is to begin shortly!). Presenting a brand new perspective on late nights, commuting, connections and lazy Sundays! This is the new framework. Spacious urban Framework Vancouver Chinatown homes coming this Spring! The development is brought to you by master builder Porte Developments, the developer of the highly successful GINGER Vancouver Chinatown condo project. Here at Framework Vancouver condos, you will find a wide range of floor plans that include studios, one bedroom + flex rooms and two bedroom layouts. There’s definitely something for every home buyer and investor. From their email desk: As a VIP registrant we invite you to be the first to view our Framework show home and learn all about what makes Framework Vancouver’s best new home community. In addition to VIP access to purchasing at Framework, we also have a special incentive available just for you…but hurry – it won’t last long. Saturday, May 10th at Noon > Presentation Centre located at 626 Main Street. Here, you can view our designer show home, learn the perks of owning at Framework, enter to win a $100 Bao Bei gift card and enjoy local treats. FIRST 15 HOMEOWNERS RECEIVE A CUSTOM KITCHEN ISLAND! * Can’t make it? No worries, just contact the Framework Sales Team and we will be happy to answer all of your questions and help you find the home that is right for you. Priced from the mid $200’s you don’t want to miss out!